America’s obesity problem is getting worse. According to the Centers for Disease Control and Prevention, nearly four in 10 American adults were considered obese in 2016. That’s a 30 percent increase over the past 18 years. Obesity also has taken a toll on young people. The CDC says about one in six children in the U.S. are obese. Since 1999, the rate has increased 33 percent. Obesity is one of the top three priorities for the Department of Health and Human Services, and it’s a risk factor for health conditions such as diabetes, heart disease, stroke and even some cancers. But it’s no longer just an American issue. The World Health Organization says global obesity rates have nearly tripled since 1975. 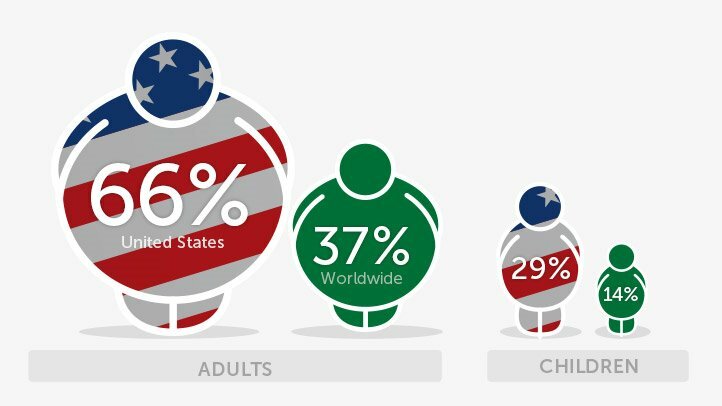 The U.S., Saudi Arabia and Egypt are among the countries that have the highest prevalence of obesity in adults. For years, the food industry, including many popular soda companies, have promoted the notion that people can lose weight if they simply exercise more. While exercise is beneficial, new research shows that proper nutrition is more effective at stimulating weight loss. Public health experts say that telling people how to eat healthier isn’t changing behavior. They’re urging lawmakers to create new policies that will change the food environment, making it easier for people to make healthy choices. In 2014, the city of Berkeley, Calif., passed a tax on sugar-sweetened beverages. A follow-up study found the sales of those beverages fell significantly at two large supermarket chains. Although the consumption of soda in the U.S. fell to a 31-year low in 2016, according to Beverage Digest, obesity continues to increase among low-income and minority populations, who are the highest consumers of sugar-sweetened beverages. For now, health advocates are communicating that proper nutrition is the way to go, rather than combining exercise with a poor diet.